If you are like me, then sometimes it’s hard for you to pick which flavor chocolate or vanilla. That is why I created these delicious cookies! I came up with the name thinking of twist ice cream cones. That’s often what people get when they can’t pick, chocolate or vanilla? 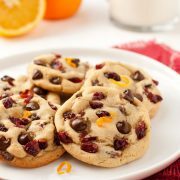 These are one of my favorite cookies! They are like an upgrade of chocolate chip cookies! 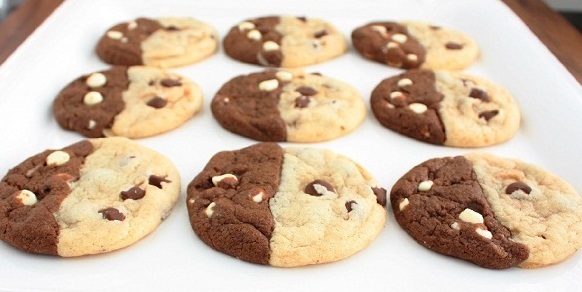 I love giving people options with food and with these you get both options chocolate and vanilla, together in one amazing, soft, flavorful cookie! If you haven’t noticed I love combining art and food and that’s what I have tried to create here, something unique and made to impress, both in flavor and looks! These are luxurious! Also, you can make these cookies with all vanilla on one side and all chocolate on the other rather than chocolate dough with white chips and vanilla dough with chocolate chips. 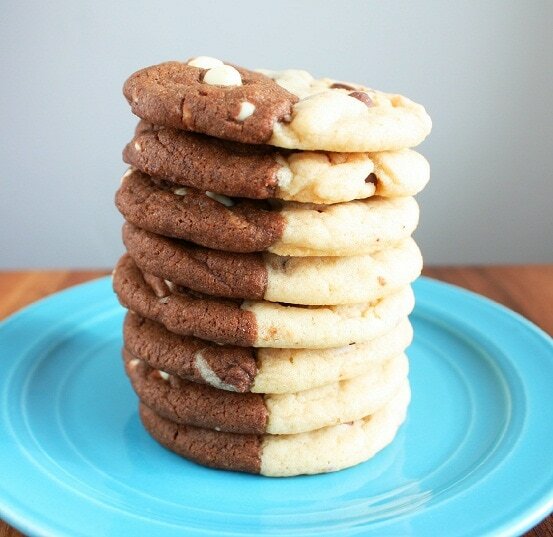 Cookies with two of the best flavors in one! Preheat oven to 350 degrees. Butter a cookie sheet. 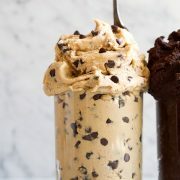 Scoop 1 even tablespoon vanilla cookie dough and 1 even tablespoon chocolate cookie dough (using separate scoops or colors will blend), now take each one and carefully meld together while cupping your hands to round edges. Places cookie on cookie sheet and flatten slightly. Do this with remaining dough, baking 12 cookies at at a time. Bake 9 - 11 minutes in preheated oven. Allow to cool several minutes before moving to a wire cooling rack. In a mixing bowl whisk together flour, baking powder, baking soda and salt, set aside. 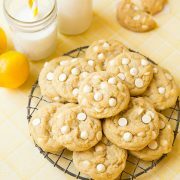 In the bowl of an electric mixer, whip together butter and sugar until light and fluffy. Stir in egg, then add vanilla and milk. Melt vanilla chips in the microwave on 50% power in 30 second intervals, stirring after each interval until melted and smooth. Add melted white chocolate to cookie dough mixture. Slowly stir in dry ingredients and mix until well incorporated. Mix in chocolate chips. In a mixing bowl whisk together flour, cocoa powder, baking powder, baking soda and salt, set aside. In the bowl of an electric mixer, whip together butter and sugar until light and fluffy. Stir in egg, then add vanilla and milk. Melt semi-sweet chocolate chips in the microwave on 50% power in 30 second intervals, stirring after each interval until melted and smooth. Add melted chocolate to cookie dough mixture. Slowly stir in dry ingredients and mix until well incorporated. Mix in vanilla chips.